March has been such a whirl that I made it all the way to April before I could stop and catch my breath. It started well with my first contribution to the Cooking Channel’s Devour the Blog and it was great to see so many of you making the jump. A new post on stocking my Latin pantry went up yesterday with more to follow. I laid my cupboard bare (well I straightened it up first) so I hope you’ll visit the site again and let us know what’s in yours. I also wrote a piece about Latin American staples – Running with the Grains – for Marcus Samuelsson‘s Food Republic that combines two favorite obsessions – seeking out new ingredients and running till I just can’t anymore. A new site covering everyone from Junot Diaz to Michelle Bernstein (who also helps spices up school lunches here), I was thrilled to be a part of their launch this week. On a completely seperate note, there was some unsettling news in the New York Times about the future of Colombian Arabica crops due to climate change and the effects of quinoa’s growing popularity (which I’d included in my own round-up) on Bolivian communities where it’s cultivated. Also in the Times, there was a great profile on Mexican chef Javier Plasencia in Josh Kun’s Master of a New Tijuana. Closer to home, Eater reported Gonzalez y Gonzalez is still holding it’s own. Initially, edged out of their Broadway/Houston corner by Chipotle, their landlord has divided the restaurant space in two so that both restaurants can co-exist side by side. I haven’t been there in years, but I used to go often when I first moved to NYC and the sign always made me nostalgic, especially since Bayamo, the Chinese-Cuban place with the giant dragon that faced it, is long gone. Still, some change is good and I was excited to read that Peruvian chef Gastón Acurio is bringing his chain La Mar Cebicheria to the flatiron district. On the art front, I caught the lastest installation of Cuban artists Los Carpinteros on its last day at the Sean Kelly Gallery in Chelsea which you can still see here. If you’re in Miami this weekend, you still might catch Pablo Cano’s cake box tribute to Havana’s Ladies in White at the Kelley Roy Gallery. While it seems like I’ve been away for a few days, I was actually in Mexico so this blog was never far from my thoughts. 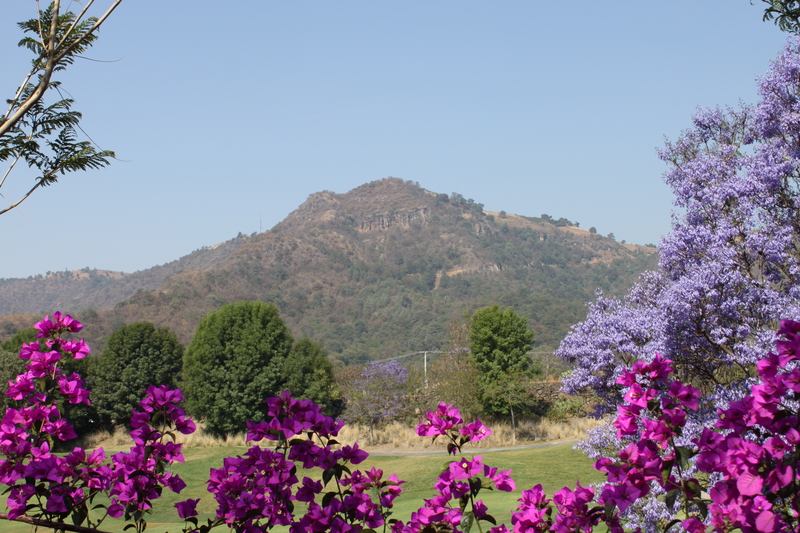 Tired of waitng for spring to come, I decided to fly to it instead and was rewarded to jacaranda trees in full bloom. Back in New York where it’s still snowing in what I can only hope is an elaborate April Fool’s joke, I’ve been trying to desperately to hold on to the colors ever since. I have a lot to unpack so I’ll be posting more in the next few days.